You are currently browsing the tag archive for the ‘collection’ tag. Despite being tired it has been an excellent day. Someday I will grow up and realize that I should not stay up till all hours reading. However! I got to make up my listening session with our interim City Librarian. There were only 3 of us there this morning, and her, and I really felt heard. I have high hopes that there will be things happening soon. Things that should make us all a little happier. We should hear more next week. And! I got my funding! For my advisory group! I am so excited! Can you tell!?! Pizza for everybody! And I moved all my new books to shelving where there is more room, because there are too many of them. It seems like every month I have more new books than the last. Don’t get me wrong, this is a good thing, but where to put them all? Next I am going to have to read fiction again. I have been enlisting the help of my awesome LAIV to help me do dusty shelf lists–it makes it easier to let them go if I just read over the titles after he’s pulled them. If I handle them all, I want to keep them. We have more of a connection. What am I reading? I have been super lazy about updating goodreads and netgalley. I hope they will forgive me for another week or so. But I have been reading. When don’t I? 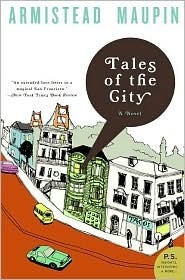 I am trying to finish Tales of the City by Armistead Maupin because it is due tomorrow. I heard about it from a friend who wrote a blog post for the library. It intrigued me enough to use one of my precious 25 hold spots for it, although the library didn’t have very many copies so it took a while to get it. In the mean time, I totally forgot why I put it on hold. I finally remembered today when I was talking about it with my manager. This series was first published in the late 70’s and details life in that time in San Francisco. As you can imagine, there is a lot of love going on, love of all kinds. It is San Francisco after all. I think one of the reasons why the description of this book was so appealing was because my uncle ran away to San Francisco when he was young, in the 70’s. I hoped to see a little of what his life might have been like then. He came back later, with a life partner and aids. I loved him very much, even though I didn’t spend time with him until his return. There was one visit to see them in San Fran when I was a kid, but I really only remember stuffing chicken in my cheeks. I was going through a phase where I didn’t want to swallow food. I can’t know if this book gives a window into what he experienced. He’s been gone for a while now, and his partner several years later. There’s no one left to ask. I hope he enjoyed it. Tales of the City makes it sound like it could have been fun, and if not, then seriously interesting. The characters are deep, although you don’t realize it at first, and Maupin has a crazy way of making all of them interconnected. Toward the end of the book, where I am now, you come to realize there is a mystery. I don’t know what it is yet, but I think I will very soon. It might be another late night. It’s been a busy week. I have been weeding again at work and decided to use a dusty shelf list for the first time ever. Some people will find it amazing that I have never used one before, but my other branches were small enough that it made sense to go through every book in my teen collection. In fact, it made sense for my first big weed here at my new branch, so that I could get to know my collection better. However, I can now say that it is big and I need to save time. So I ran a dusty shelf list–anything that hasn’t circ’d in a year–then went through and pulled anything that looked yucky (water damage, food stains, obvious wear and tear). That did the trick and I am very happy with the results. Because another thing about a large branch? When all the kids going back to school bring back all their books at once, suddenly your shelves go from having some wiggle room to blowing off the book ends. Shelver hell. I am also on a short term committee to find a good scheduling software. So, um, if you know of any, please email me. We just scheduled February and March computer classes, but found out that our grant for job classes has run out. That’s ok at my branch, as we had pretty low attendance for those, but I am sure it will hurt in other areas. So how about that Amazon issue on free speech? All I care about the issue is talked about over here, and since I don’t really want to fan the flames on that one, I will leave it there. I also had some fun times the last week or so. I saw Stars at the Showbox. They are everything I love about music. Amy’s voice is like an unannoying angel and Torquil counters her sound perfectly. Like talking heads and…I don’t know. Just perfect. And the next day I played Kinect at my brother’s place. That is a fun system–loved the dance game we played. Part of the point was to look like an idiot, so I fit right in with everyone ;) The Boy was with me and he had a good time with it too. He says he will wait until it has better games before he upgrades, though. On the left are some orange caramels that I made after boiling sugar water for the candied orange peels on the right. 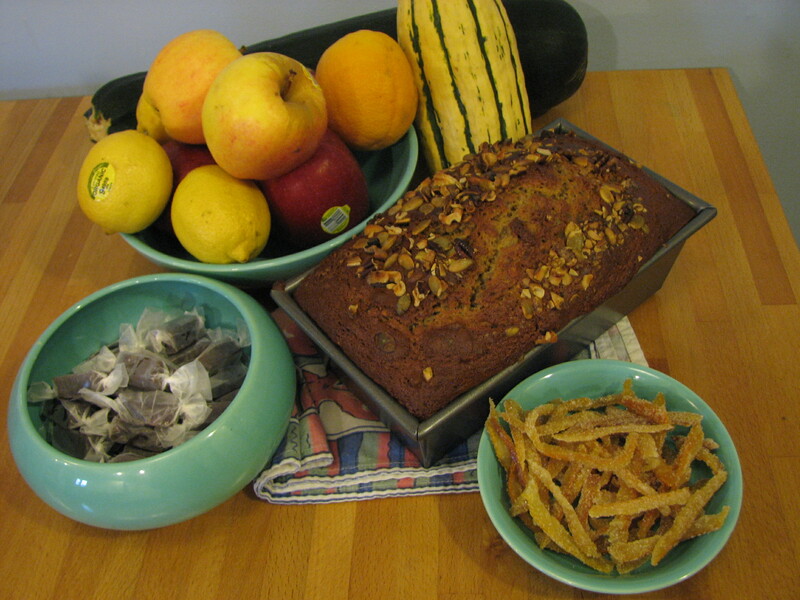 Behind them is the Harvest bread I made from the Macrina Bakery cookbook. I so hope it is similar to the bread that I scarf every time I go to Top Pot lately. I cheated a bit with the milk in these recipes. I didn’t have heavy cream for the caramels, so when I heated my non-fat, I added a tablespoon of butter. I also didn’t have buttermilk for the bread, so I added 1tbsp of lemon juice per 1 cup of milk. The caramels are delicious and I can’t tell any difference from the time I made them with cream. What am I reading? I just started getting galleys from netgalley, because I found out I could read them on my ipod using the Bluefire app. I find I actually like reading on my iPod, although I am not sure about buying digital books–mostly because I mostly only buy physical books to give away–but I hear that the library is talking to Bluefire to make an agreement so that ebooks loaned by the library from Overdrive would be able to be transfered the same way. Crossing my fingers! The galley I am reading now is The Lying Game by Sara Shepard–the same author as the series Pretty Little Liars. This book is the story of Emma, a foster kid who is somehow still a sweetie, who just wants to graduate high school and go to college. That becomes impossible when her foster family’s son decides to frame her for stealing and they inform her that she will be out on her 18th birthday, only 2 weeks into senior year. Emma thinks things might get better when she finds out she had a twin sister and that she is living close by, adopted by a well off family in Arizona. She goes to meet this sister, Sutton, only to find herself trapped in a situation where he sister has been murdered and she is forced to pretend to be Sutton, or be murdered herself. This book is a bit like Lovely Bones, as Sutton is a character in the story, a ghost who is constantly looking over Emma’s shoulder, hoping to find out who is behind her murder. I am enjoying it so far, although I don’t usually like books with the mean girl element. Flash backs to middle school, you know. Of course I loved Behemoth and decided to get both it and Leviathan on CD for our driving trip over the holiday. My co-worker told me that the reader is amazing, so it seems like a good bet. Then I can get The Boy hooked on them too. I am home sick today. Luckily there is nothing really pressing that I am missing at work, although there is always something I should be doing. Yesterday was super busy with reference questions and readers’ advisory and I was alone last night. I doubt that is what gave me an upset stomach though. It is all ginger ale today. There was one cute dad and son duo who wanted picture books with superheroes. I showed them the youngster comics (vs teen or adult), but those seemed a little much for an almost 2-year-old. All of our superhero picture books were checked out, but I put several fun looking titles on hold for them. Dad was very excited. One of the drawbacks of being a very busy branch is that we often do not have popular titles that are on the shelves at other branches. When I first got to my new branch, I felt like the shelves were full of fluff and books you give kids who have read all the popular stuff–not saying they are bad books, they just haven’t gotten the acclaim of others due to timing, marketing or whatever. Soon I realized that everything I am used to seeing and being able to recommend was simply checked out. Which is a good thing, but makes RA difficult. I can see this happens in adult and children’s collections, too. There is a computer class today, but it is taught by a coworker. I have one on Friday, so I need to make sure I am better by then. I am a little glad that the weather has turned rainy again so that people will be more motivated to come to our classes rather than spending the day in the sunshine. Being Treasurer is anti-climatic so far. We had an executive board meeting last Friday where I was vocal on the points that mattered to me and listened otherwise. I once called someone by the wrong name and another time said the wrong month repeatedly–but I am sure no one noticed what a moron I am ;) I need to find that magic thing that will open up my memory for words and names. What am I reading? Bitter Seeds by Ian Tregillis is an alternative history of WWII Europe where a Nazi doctor has made gods out of children, or just experiments gone wrong. I am about a quarter of the way through and enjoying it. I have to say that I don’t understand why someone who likes this wouldn’t like Boneshaker. I’m just saying. (This was recommended to me by someone who didn’t and when asked why, just said “I couldn’t suspend my disbelief.” Hmm. I also just finished Foiled by Jane Yolen, which was very good. I loved this story of a young woman who is a fearsome fencer in New York. At school one day she meets a beautiful boy and falls for him, but something is not right. When his anger and fear show themselves, she is strong and stands up to him. Beautiful graphic novel, wonderful story.